Sensory Connection Program Games CD is designed to make game cards and posters for all of the games in the Sensory Connection Program: Activities for Mental Health Treatment (Manual and Handbook). These games can also be used for any health related skill building groups. Directions for the games are included. Examples are colorful cards for the sports matching game and question cards for the "Who Would You Call?" Game. Games address skills such as communication, goal setting, identification of supports, safety strategies, emotional expression, assertiveness, socialization, and coping strategies. 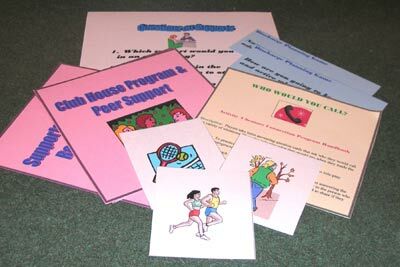 The games are appropriate for adult mental health settings, substance abuse treatment, and adolescent programs. Games can be easily adapted to use in educational and geriatric settings as well. Cards and games posters are ready to be printed out on colorful card stock, cut up, and laminated. The CD makes skill building easy and fun for staff and participants. Jennifer Maloney from Lehigh Valley Hospital in PA reports: "The Games CD is awesome!" Save time and effort. Colorful graphics make game cards fun! Click here to try out a Sensory Connection Program Game including directions and game cards. Just print them out on card stock and laminate.